I think cabbage is underrated. It is such a versatile vegetable. 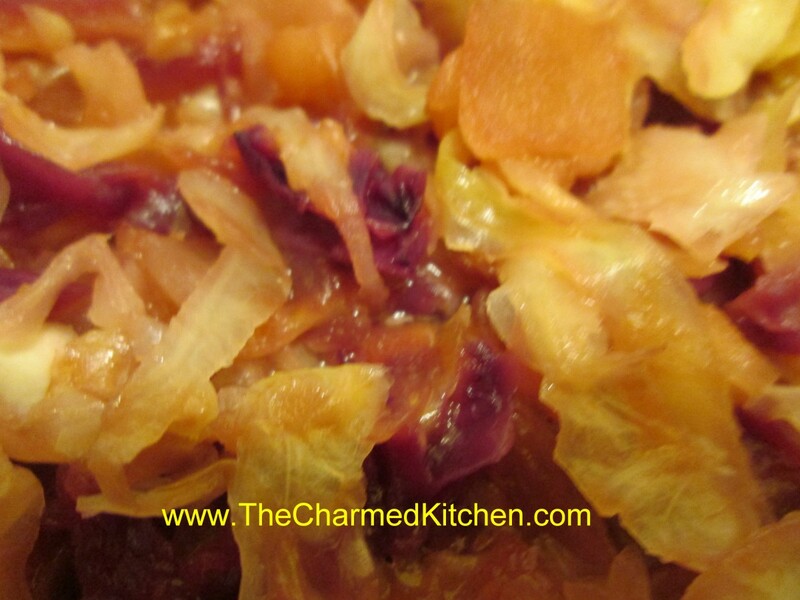 Cabbage is good in both hot and cold dishes, it isn’t expensive, and cabbage is good for you. Big heads of cabbage are at all the local farm stands this time of year. I was looking for a side dish for a chicken dinner the other night and I decided to start with cabbage. Since I had a pretty good sized head of green cabbage, and just a small piece of red cabbage, I mixed the two together. I added cider vinegar, sugar and seasonings. Then I added apples to round out the dish. It had a sweet and sour flavor that went well with the meal. In many ways, cabbage, with its earthy “greenness”, pairs perfectly with sweet/tart apples. 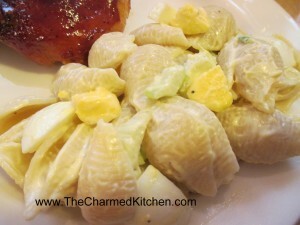 I would also serve this as a side dish with duck, beef, pork or even a lamb roast. It would go well with any of them. 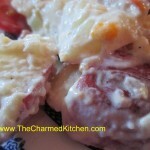 You could use any color cabbage for this dish- or combine colors, as I did. Perfect for a Fall dinner. I’ve been in a nostalgic mood this week. First, I posted my Mother’s breaded chicken recipe. Now, her macaroni salad. For summer cookouts, we always had this salad. Long enough ago that it was called macaroni, not pasta. I loved it then, and I love it now. I won’t say I don’t make other pasta salads. I do. I make all sorts of combinations, but this is the salad that brings me home. Mom used mostly mayo, with a little salad dressing like Spin Blend. She felt it gave the salad just a little more zing. I use straight mayo, but that part of the recipe is flexible. She added quite a few hard cooked eggs and I think they add a richness to the dish. My dad would cut up the celery and green onions for her. Mom liked the veggies cut into a fairly small dice in this dish, and Dad had great knife skills. I love the image of them cooking together. So here it is- a family recipe wrapped up nicely with some memories, too. Cook pasta according to package directions, but do not overcook. Rinse with cold water and drain well. Place drained pasta in a large bowl and sprinkle with salt and pepper to taste. Add dressings and vegetables and stir until well mixed. You may want to add more dressing to suit your taste. Chop eggs and stir into salad. Adjust seasonings if needed and chill before serving. Serves 8-10. If you are looking for a side dish for the 4th, why not bring a potato salad? Everybody loves potato salad. I love potato salad. Actually, I love potatoes pretty much any way they are prepared. 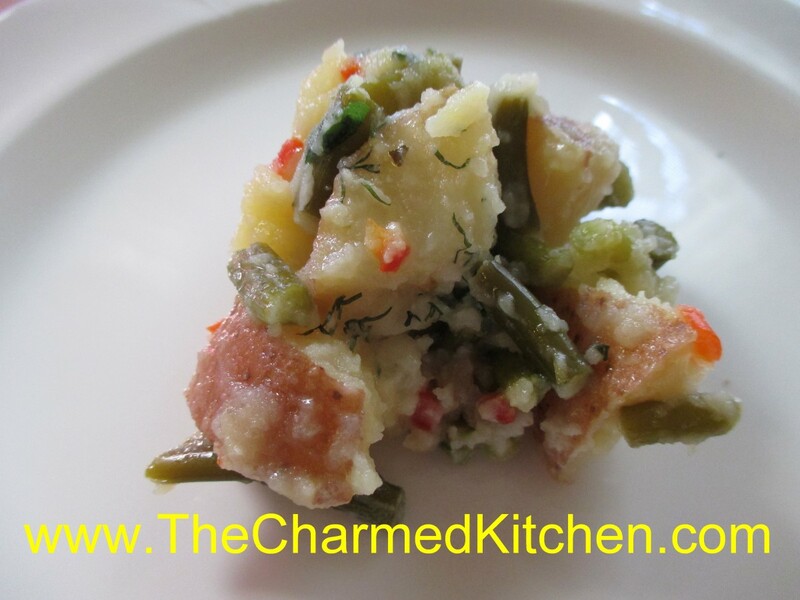 With so many cookouts and picnics, you can never have enough potato salad recipes, right? 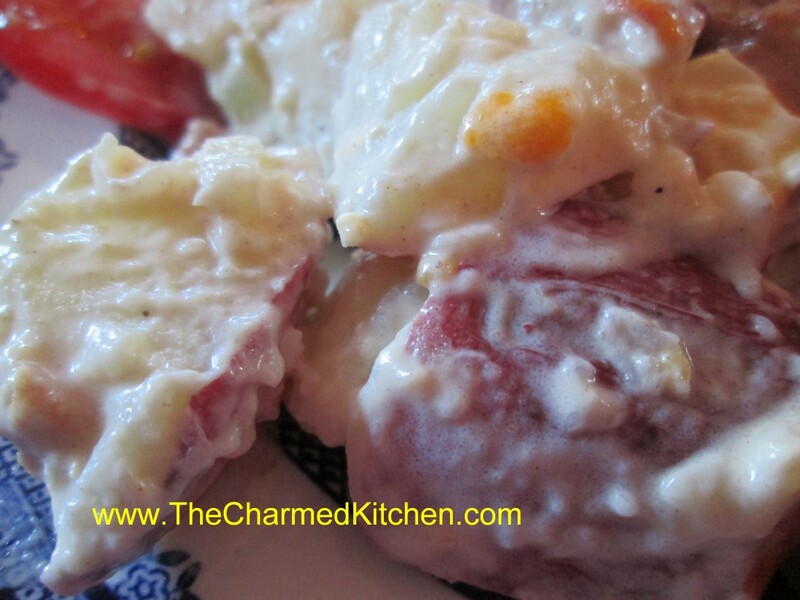 I am sharing three of my favorite potato salad recipes. The first one is really simple, enhanced with fresh thyme leaves. 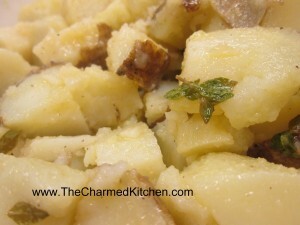 Thyme really pairs well with the potatoes. 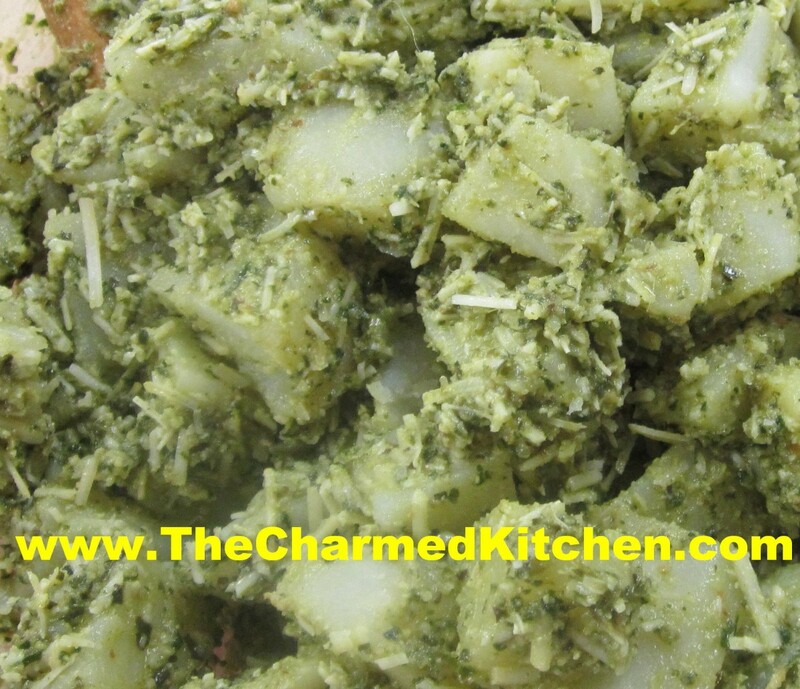 The second one uses some of my fresh basil in a pesto sauce that is tossed with the potatoes. Who says pesto is just for pasta? The third salad is the way I remember my Mom making potato salad. She never wrote down her recipe, but I think I got it right. With my herb garden growing like crazy right now I thought this was the perfect dish to make. This salad can be served warm or cold and goes well with so many dishes. I find when I have leftovers, I’ll even brown it in a skillet and serve it like hash browns with eggs for breakfast. This salad always makes me think of a warm summer day. I think it’s because of the basil. During the summer, my driveway is lined with pots of basil. I cook with it almost every day. Pesto can be used in a lot of different dishes beyond pasta. Here I’ve paired it up with potatoes. The combination works great together. I always freeze extra basil so I can enjoy it year round. Cook potatoes until tender. Cool. In blender combine remaining ingredients, except 1 tablespoon of the pine nuts. Pour blended mixture over potatoes and sprinkle with the reserved nuts. Chill. Serves 6-8. 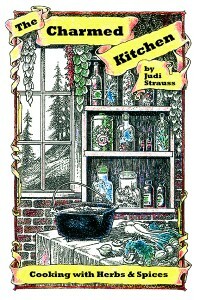 When I was a kid I did not like the taste of mustard- except in this recipe. It adds such a wonderful flavor. 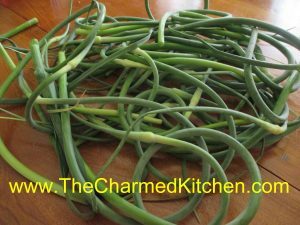 If you have never had garlic scapes, you don’t know what you are missing. Garlic scapes are the green shoots removed from hard-neck varieties of garlic. By removing the shoots, the bulbs will get bigger. So farmers remove them. They curl as they grow, and are good served raw, or barely cooked. They are showing up at farm markets around here right now. When cooked, the flavor mellows a lot. I love to steam garlic scapes for about 5 minutes, then just eat like fresh green beans, with butter and salt. I steamed a bunch of scapes the other day- then chopped them up and added to potato salad. So tasty!! 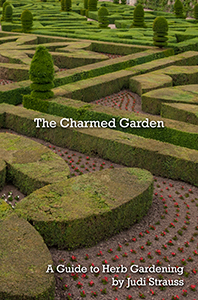 They have a rich, garlic flavor that is all the sweeter because of the short time they are around. Enjoy them when you can- they will be gone soon. I sometimes use scapes in place of basil, in my pesto recipe, or combine them with parsley in a garlic scape-parsley pesto. You can also combine the garlic scapes with cottage cheese in the blender- add a little lemon juice and hot sauce for a tasty dip. 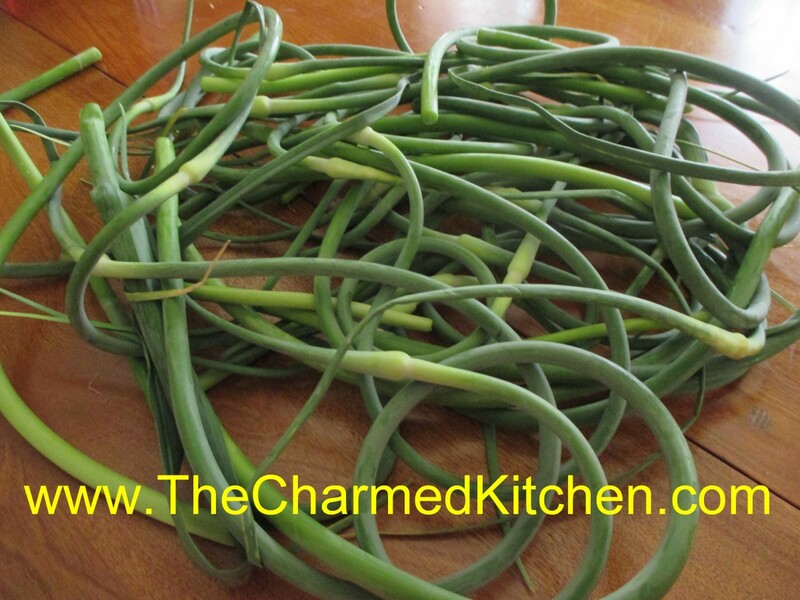 Here are some more recipes for cooking with garlic scapes. Combine all ingredients, except the cheese, in a blender and mix until smooth. Stir in the cheese and toss over hot, cooked pasta or use as a sauce on meat and poultry. Sauce will keep a few days in the fridge and makes about 1 1/2 cups, enough for 1 lb. of cooked pasta. In the container of a blender, combine the garlic scapes, lemon juice and salt. Blend at medium speed until smooth. Continue blending while pouring olive oil into the blender in a thin stream. The mixture should become thick and white almost like mayo. Store refrigerated in a glass container. Nice on hot pasta, cooked rice or grains or brushed on meats while cooking. It also is a great salad dressing. 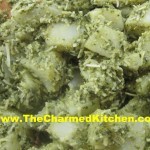 Place garlic scapes in a food processor with the salt and blend into a paste. Add olive oil, vinegar, and mustard. Pulse until smooth. Place garlic scapes mixture in a bowl and add the broccoli. Stir to coat. Chill for 3 hours to marinate, stirring occasionally. Sprinkle with Parmesan cheese before serving. Tastes even better the next day!! !